I’m pleased to introduce you to author Tomi Akinyanmi’s first book titled “A Worthy Legacy” which is based on her own personal experience of losing her father. When my father died suddenly in a car accident in May of 2001 without a chance to say good bye, grieving him was tough since there was no sense of closure. Dad was a man of words, so I knew he would have wanted to have one last say before he took his final breath. With this thought in mind, the writer in me sought closure by writing his last words for him. Before his death, as I grew into adulthood, I had different opportunities while on holidays from college to sit and talk with dad. I jotted down a collection of quotes and thoughts on life over the years that had originated from those discussions. Thus in creating a truly unique last words for dad, I dug up the old folder of quotes. My reflection on dad’s life and his approach to life, brought the old man with his philosophical approach to life. Based on my relationship with dad’s deceased elder brother (who being much older than my dad, was more a grandpa to me than an uncle) I wrote of the amazing relationship between this old man and his granddaughter. For the story to be complete, it was imperative that the family described in the story reflects the kind of family dad was used to having around him. So also was it necessary to include our family’s discovery after dad’s death of how strong his ties and influence extended beyond the confines of our home to the community in which he lived. Putting all these together a simple wish for last words from my father became a book – getting bigger than I had originally imagined. It took a few years to get it all down but slowly the manuscript matured and ‘A Worthy Legacy’ as you see it now was born. 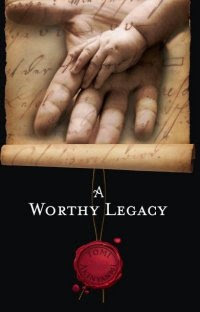 Tomi has offered to giveaway two autographed paperback copies of “A Worthy Legacy”.